WARNING: without Robert's bodies installed your game may lack of beauty. 22 beautiful hairs by Newsea - newseasims.com or http://newseasims.tumblr.com/ were picked and converted by Max specially for you! 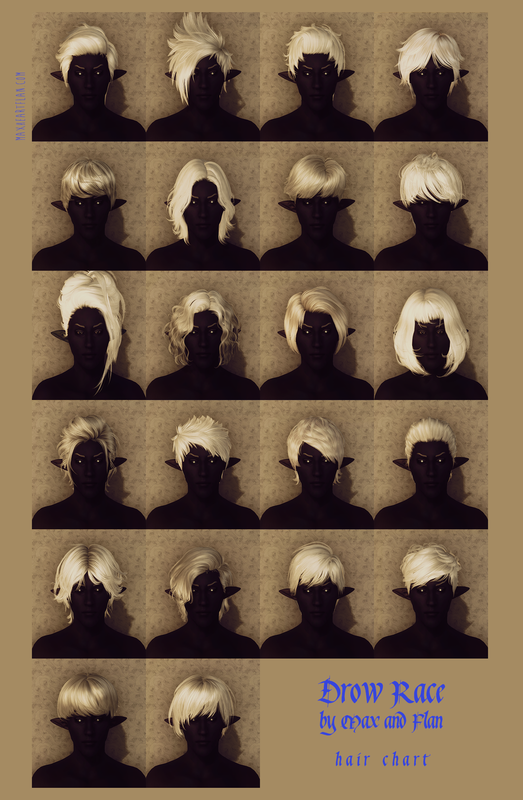 There's a variety of 'boyish' and 'girlish' styles for your Drow. As a compliment for those who use and love our races i have added a couple of female-only hairs by Newsea - get them fresh! you won't see these in our standalone hairpacks. Dustin tried himself in retexturing the Carl hair, making it soooo beautiful. 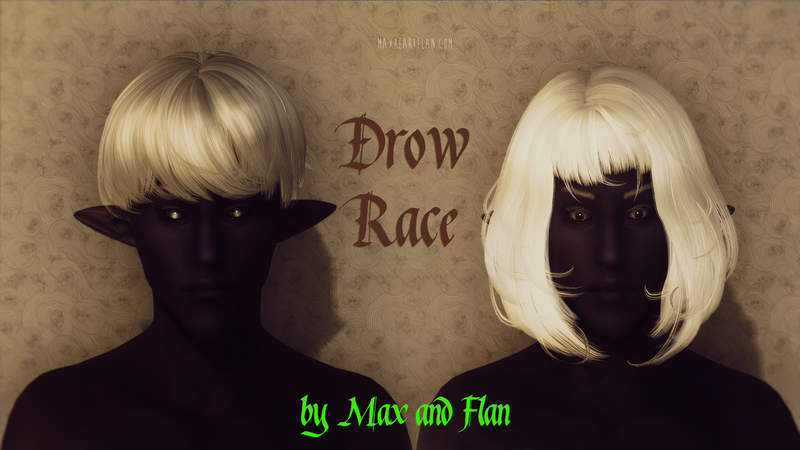 The Drow race is packaged with seven exclusive Flan's Spirit Orb v2 eyes, which make their debut on public release. Dustin has made a new beautiful face for the race esp. The 2 genders are covered. (Robert's bodies). 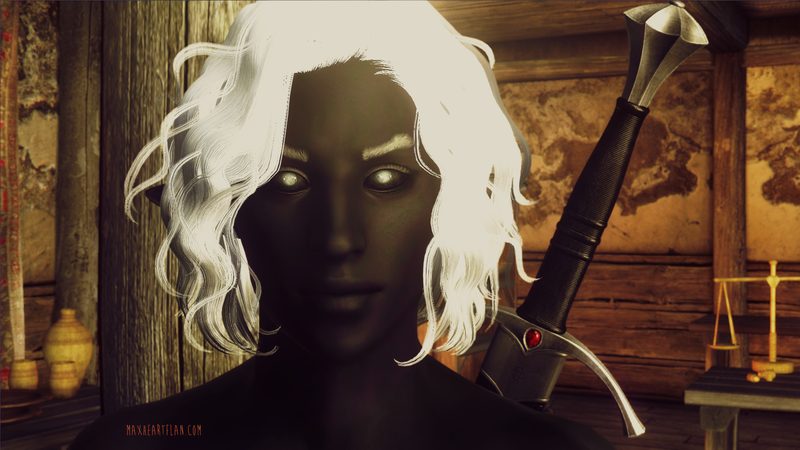 I've given the eyelashes to the Drow, they're similar to those ones I used for the Naturals race. In the optional folder, one can get a Drow companion named Morvus. Meet him in A Warlocks Luck shop in Bravil. Don't worry, he would gladly leave the daddy for you (or rather for your money). Traditionally, one has to dress up the companion, because he's wearing vanilla clothing from Shivering Isles. Morvus is nicely armed though (thanks to amazing Lazarus guy). This is beautiful! 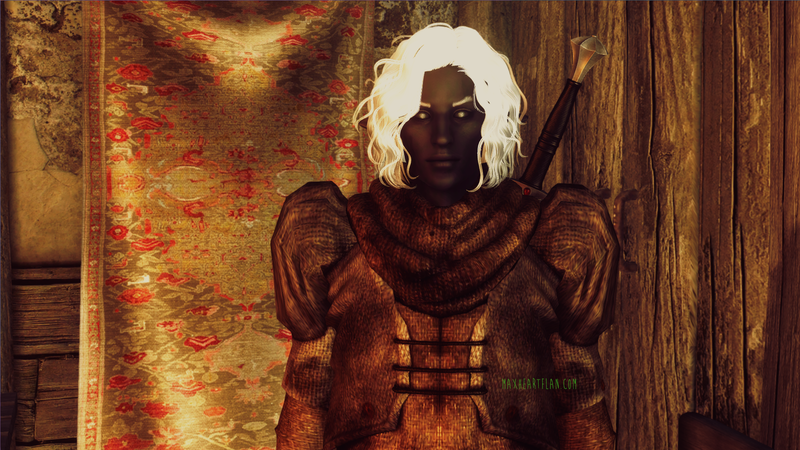 I just made my own drow, that I'm rather attached to, otherwise I'd be all over this. My drow uses Dustin's bases, though, as usual for my races. Hope you don't mind. Yours are beautiful. I love the eyes. They look haunting. As always, absolutely beautiful! I love your work. It's a must in my game. Your work is amazing, thank you for sharing this. I realize I'm years late and all, but wowie! This is so cool! And the ears, the move! How did you do that? Anyway, great mod!